Congratulations you made the bike squad. Now what?? 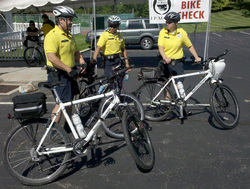 Where do you go for all the information on what you need to operate an effective bike patrol? Welcome to BikeDuty.com your source for information on police and first responder bike duty gear, through product guides with direct links from the manufacturers. We also have a training and resources page for the department, to assist you in making valuable decisions. This site does not intend to favor any single bike or product, but will show all the various products with costs and availability at different dealers with their options. How often have you needed to know the where and whys? You can search from one place for all your Police Duty Bike and First Responder Gear and equipment. Depending on your topic, we will have the resource page that will list the most current web postings of the information you need with links to those resources. So lets get started..... You made the bike squad, got promoted as the bike team leader or are the Chief looking to make informative decisions. You are at the right place. If you see something on the site that is incorrectly stated please let me know by using our contact page. The information here is all public information found through internet searches and links. All of the descriptions of products, warranties, availability are the responsibilities of the respective manufacturers. The opinions here do not reflect those of the respective manufacturers or dealers. Just straight advice to help you decide. Use these resources as a guide to make a better business decisions when it comes to starting, upgrading and keeping your bike team ready and prepared for duty. Thank you to all the first responders for your dedication and service to your communities. New Stop and Swap page. You have a bike, light, holster you dont need any more? Want to swap for something different? Sell or Trade your gear directly with other first responders. Go here to see whats there. See you in Fort Worth at the IPMBA Conference in 2019. Visit us at the Vendor Exhibits.